Rentv 10/2/12 Kilroy Realty Corporation has just announced two large Los Angeles office acquisitions, as the West LA-based office REIT continues to boost its portfolio in sync with Southern California’s improving technology, media and entertainment economy. In one of the deals, Kilroy spent $65 mil on Columbia Square, an historic media campus in Hollywood. In the other transaction, the company expects an early fourth quarter acquisition of Tribeca West, a West Los Angeles entertainment-oriented office property, for $73 mil. At full build-out, the 4.7-acre Columbia Square site in Hollywood will include a mixed-use development of up to 650k sf, reduced from a recently entitled 875k sf project. This newly acquired site at 6121 Sunset Blvd will be redeveloped to preserve its historic character, while creating a state-of-the-art media campus, a new residential community, and an amenity-rich retail environment. Columbia Square is currently undergoing significant upgrades and repositioning, and continues the expansion of KRC’s media campus offerings, which include Westside Media Center, home to Shopzilla, Fandango and Comcast, to meet the unique needs of the “digitainment” industry, a growing segment transforming the business landscape of Los Angeles. The purchase also follows the firm’s recent $79 mil acquisition of Sunset Media Center at 6255 Sunset Blvd at the beginning of August 2012. “The entertainment space is experiencing an exciting revival with the convergence of the tech and entertainment industries. KRC is positioned to create synergies for the production, post-production and creative media companies whose operations are currently scattered throughout the city,” explained David Simon, KRC’s executive vice president for the Los Angeles region. As L.A. continues to grow its creative economy, Hollywood is experiencing a revival driven by its live-work environment, which has and will continue to be the catalyst for both larger and smaller entertainment and media companies locating there to collaborate with large studios and production companies. Upon full build-out, KRC will have invested $300 mil in the new Columbia Square media campus. 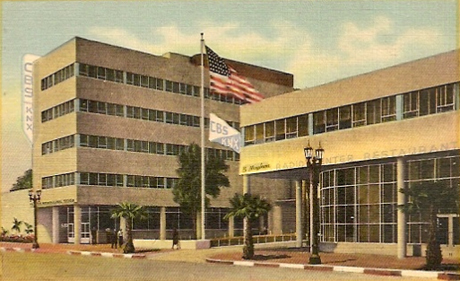 The Columbia Square site has a rich history in Hollywood, described in the 1940s as “a magnificent structure…where the motion picture industry first took root in Hollywood in 1911.” KRC is working with a premier team of Los Angeles-based architects and designers including Roschen Van Cleve, Rios Clementi Hale and House & Robertson on the multi-phase redevelopment and development of the site. This will include redeveloping the existing, historic office buildings, preserving the International Modernist design of Swiss architect, William Lescaze, and developing approximately 550k sf of additional office, retail and residential space over the next several years. For KRC, Tribeca West at 12233 W. Olympic Blvd will serve as inspiration for its Hollywood properties. Tribeca West has a rich track record as the post-production hub of such box office hits as “The Campaign,” “Snow White,” “Savages” and “Wall Street: Money Never Sleeps.” Tribeca West further enhances KRC’s ability to deliver the flexible environments that catalyze collaboration across the tech and entertainment sectors. KRC continues to develop its portfolio to meet the needs of the market, acquiring and remaking properties to serve the growing need for increased housing options, desirable amenities and closeness to major studios coupled with proximity to public transportation and freeways. Kilroy Realty Corporation, a member of the S&P Small Cap 600 Index, is a real estate investment trust active in premier office and industrial submarkets along the West Coast. For over 60 years, the company has owned, developed, acquired and managed real estate assets, consisting primarily of Class A real estate properties in the coastal regions of Los Angeles, Orange County, San Diego, greater Seattle and the San Francisco Bay Area.